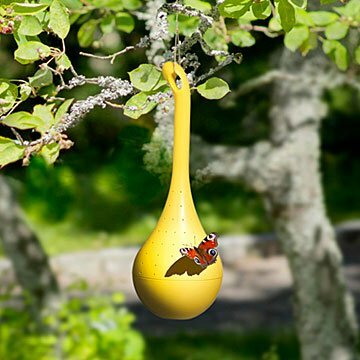 Shaped like a nectar droplet, this modern feeder will make your garden the new hot spot for butterfly hangs. Hoping for more butterfly visitors in the garden? Don't just wing it—use this intelligently designed feeder to make your backyard their latest favorite hangout. Shaped like a nectar droplet and made in butterflies' favorite color (yep, turns out they're really into yellow), this feeder is not only effective, but super simple to use. Just mix the included nectar powder with a bit of water, pour onto the sponge, close it up, and let the garden party begin. Made in Finland. 11.6" H x 4.1 dia. Hand wash with warm water when needed. Add a few drops of vinegar and rinse thoroughly. Not dishwasher safe. Store indoors for winter months, not frost safe. Let the sponge dry thoroughly before placing back inside the feeder. Hang the feeder using a strong string or fishing line. Refill nectar as often as needed. During hot and sunny periods, you may need to refill more frequently.